Here's what you need to know about Eat Move Sleep: How Small Choices Lead To Big Changes. Eat Move Sleep is fantastic. 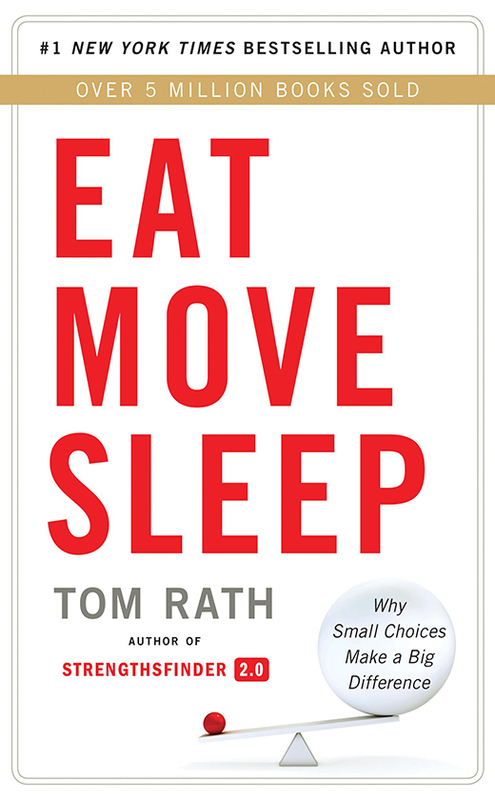 It’s written in bite-size chunks, it’s easy digest, and it provides insightful information coupled with practical steps to implement it, including a 30-day guide to getting started as well as links to interactive resources at his site, eatmovesleep.org. Rath, born with the extremely rare genetic disorder Von Hippel-Lindau (VHL), must continually fight rampant cancerous growths throughout his body. He has turned his enemy into our ally, sifting through essential research (the book is highly documented) to provide us with information to know and practices to adopt to live healthier. 1. Disclaimer: I'm leery of anyone who purports to have the "be-all/end-all" guide to health. That's not Tom Rath. His opening disclaimer identifying each person's unique situation sets an appropriate tone. 2. Research: Rath has done his homework. There are more than 400 references so you the reader can link back to the work from which he draws his ideas. 3. Pacing: Rath wrote this book standing up -- on his exercise machine. While I didn't feel winded as I read it, I did enjoy the short chapter and "cut-to-the chase" approach. 4. Content: It is outstanding. Sure, some things were obvious, but many were not. I learned and lot -- and I'm changing how I eat, move, and sleep in light of it. 5. Summaries: Eat Move Sleep includes concise chapter highlights/action points. I find this very helpful for review and to determine action steps.